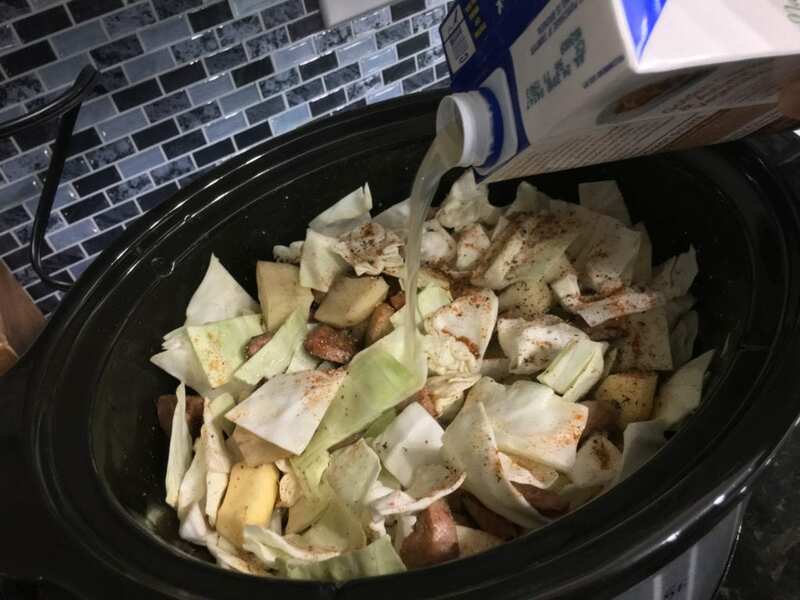 If you’re looking for a fast and easy recipe then this Slow Cooker Sausage and Cabbage will be perfect for you. 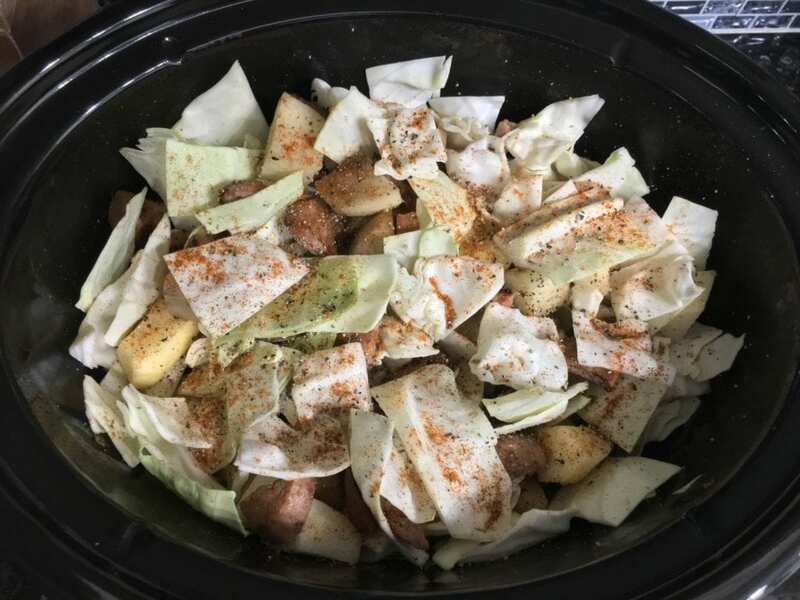 Special perks since Slow Cooker Chicken and Cabbage also happens to make a fabulous St. Patrick’s Day meal! 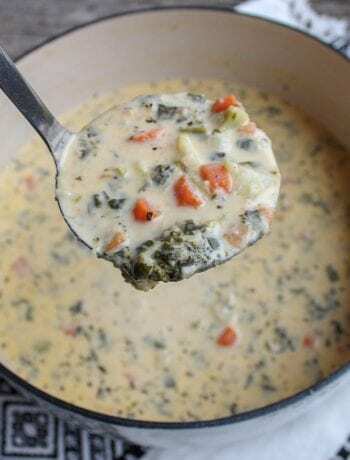 I have to tell you the back story on how this recipe was created. If you follow me on Instagram then you know I have had quite the fun (totally being sarcastic there in case you missed it!) time with Walmart Grocery Service here lately. 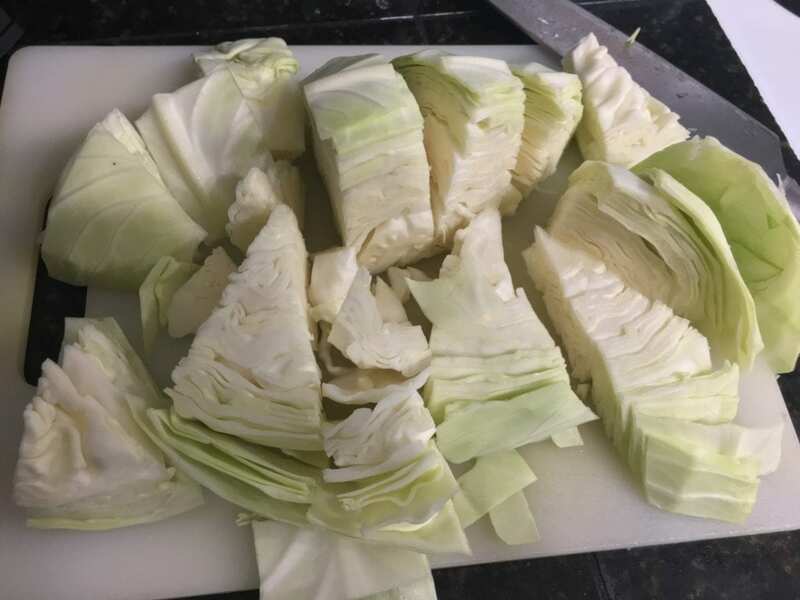 Well, one day I ended up with an entire head of green cabbage (don’t ask me how!). 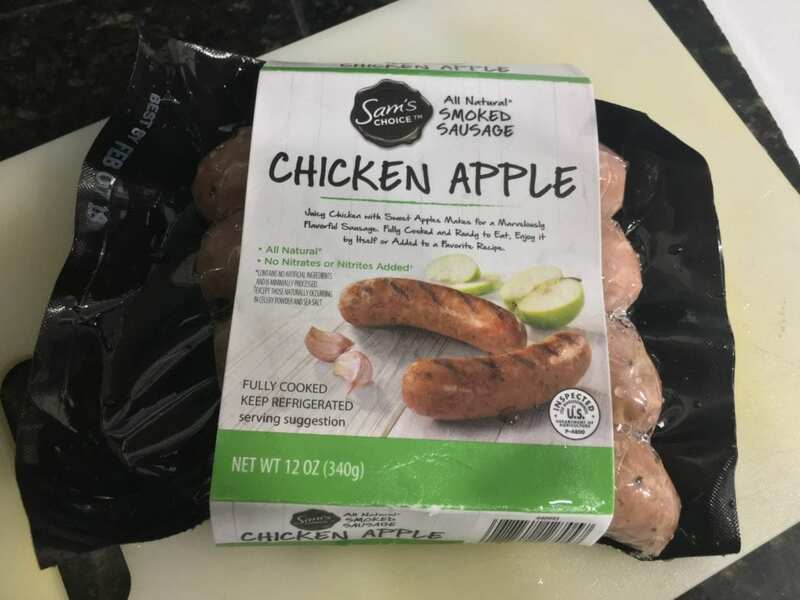 Since I can’t stand to waste food and I already happened to have this delicious Chicken Apple Sausage in my freezer, this recipe was born! 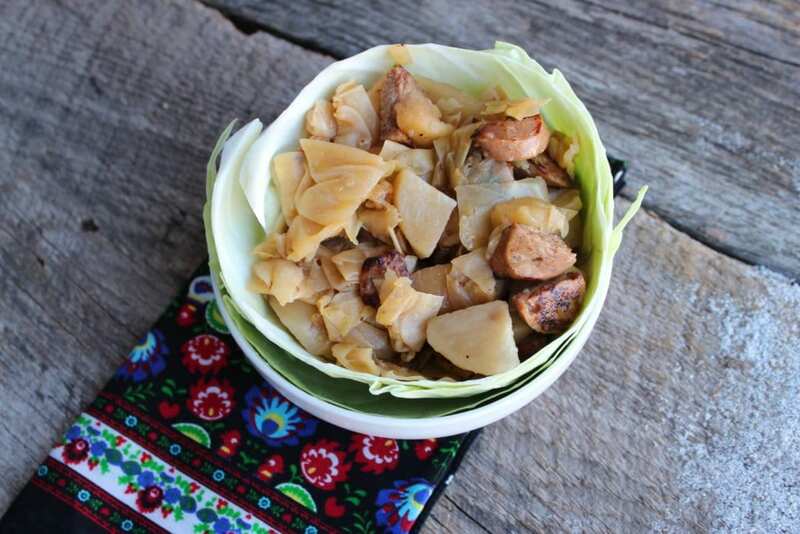 Slow Cooker Sausage and Cabbage is simple, delicious, and so filling! I wasn’t sure if I would like this meal but I’m already craving it again. Let’s get started cooking! 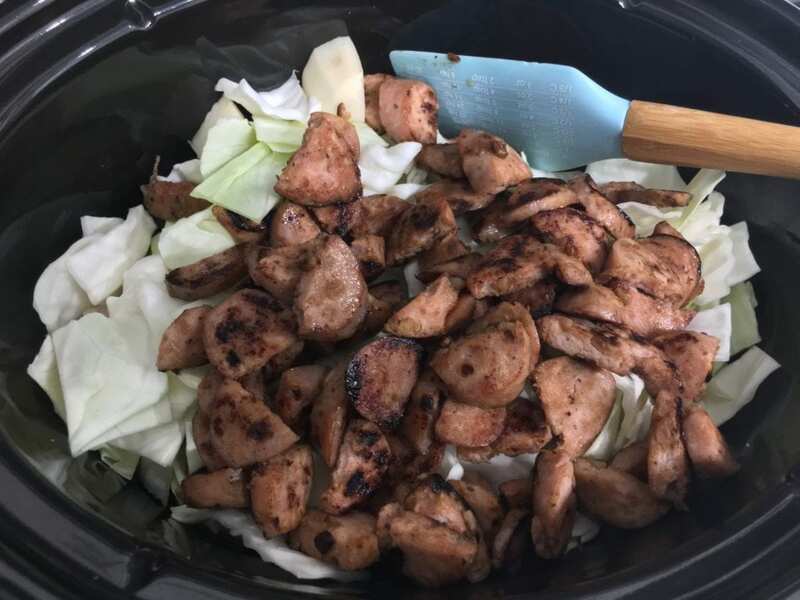 this is the Chicken Apple sausage I used for this Slow Cooker Sausage and Cabbage. You could use any brand you like, but this one happens to be my favorite, it’s cheaper than any other brand at my grocery store, and the ingredients are good and clean! Remove the packaging from the Chicken Apple Sausage and remove the casing from the sausage links. I do this by getting the sharp tip of my knife just under the end of the casing on the end of the link of sausage and making a slit. Once the casing is cut open, I just peel it all off with my fingers. I supposed you could leave the casing on the sausage but I personally think that sausage casing is SOO gross! Once the casing is removed from all of the Chicken Apple Sausage links, cut them on the diagonal. You could cut them into rounds if you prefer but I personally love how they look when cut on the diagonal. 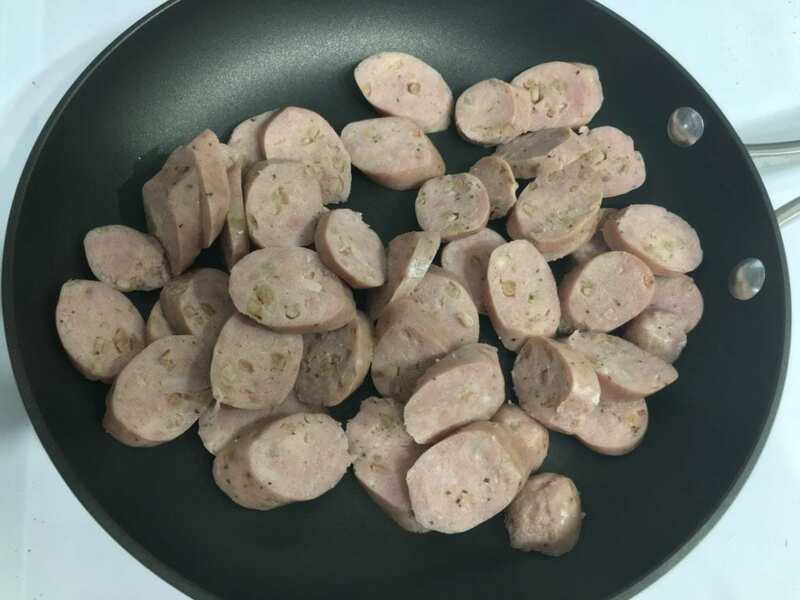 Place the cut sausage in a hot skillet and sear it on both sides. 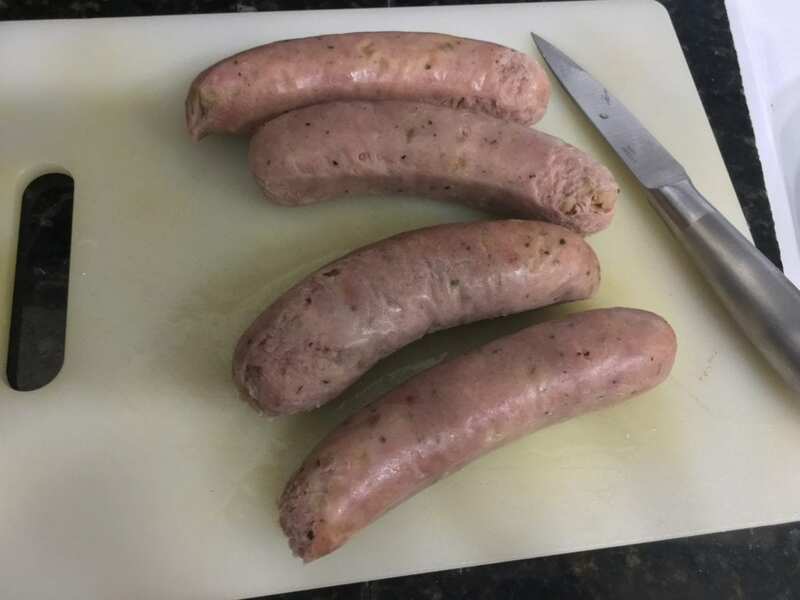 I love to give my sausage a good sear before throwing it in the slow cooker because the blackened outside gives the sausage such a wonderful flavor! While my sausage cooked, I decided I didn’t want it in large slices so I used my spatula to cut each slice in half. You don’t have to do that, and it definitely looks prettier if left in the larger slices. Just do what ya feel! 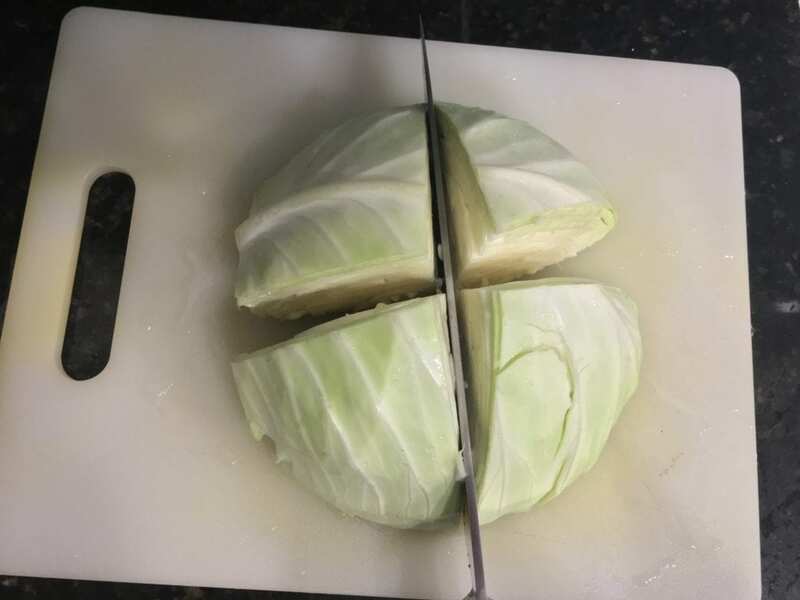 Once the sausage is seared to perfection, slice a head of cabbage in half , cut the stem off, and wash the half of cabbage. Set aside the remaining half of cabbage for a later time because you’ll only need one half of a head for this recipe. 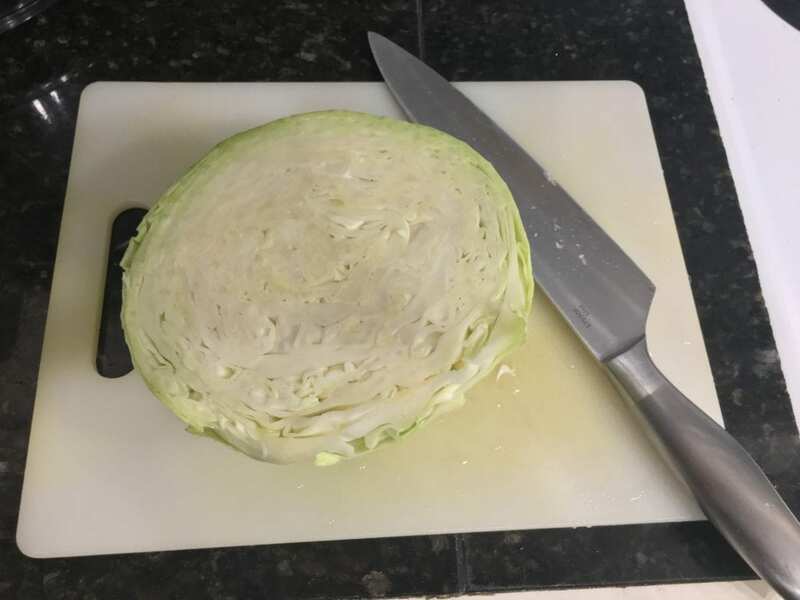 Now I’m going to show you how to cut this cabbage properly for this recipe. It really doesn’t matter how you want to cut it, but this is how I cut mine. Start by halving it into large fourths. Slice those fourths into eighths. 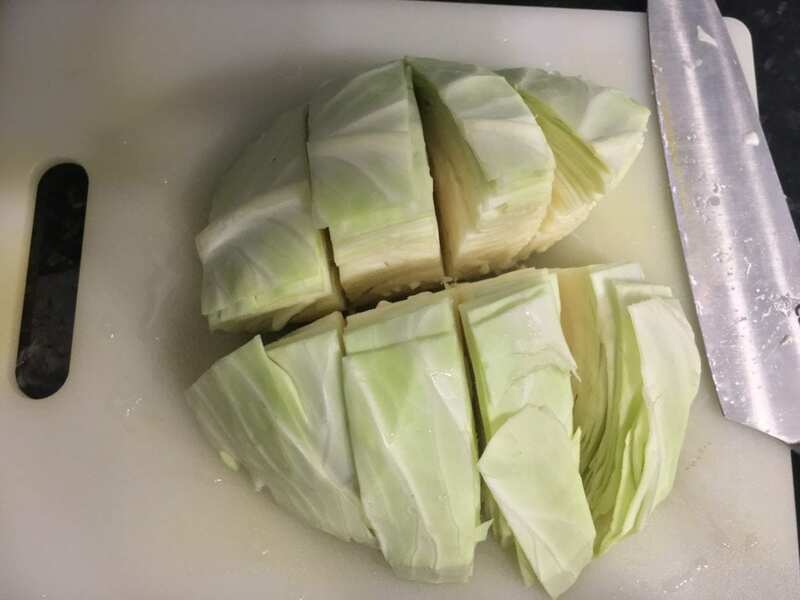 Now just slice the cabbage into large squares. Place the chopped cabbage into a five quart or larger slow cooker. 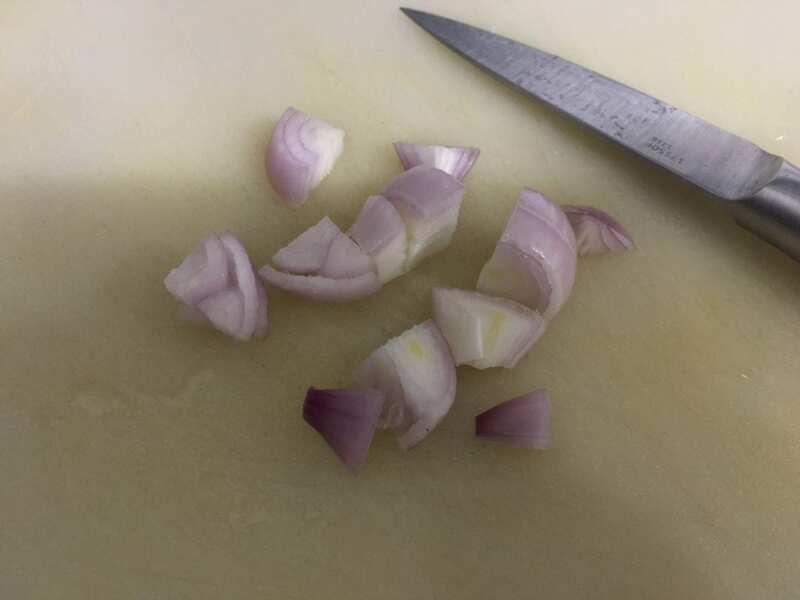 Peel and dice three shallots. 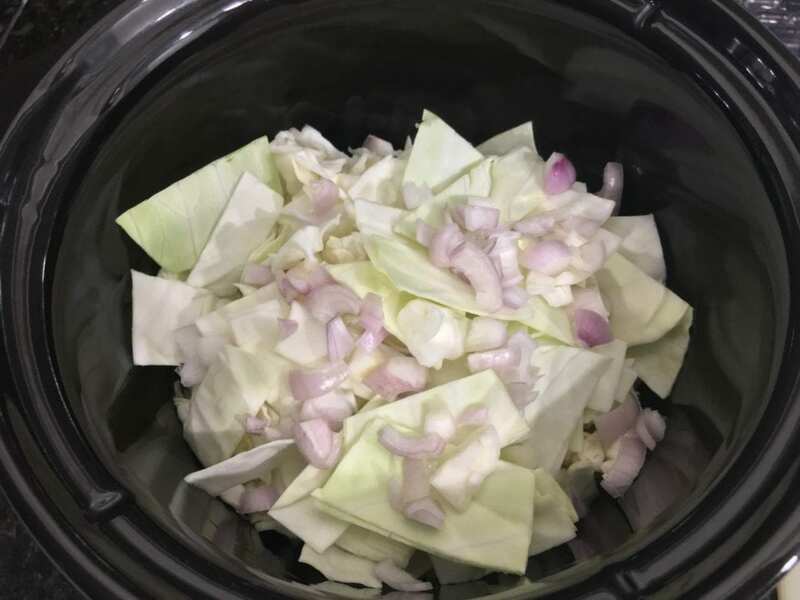 Add the shallots into the slow cooker along with the cabbage. 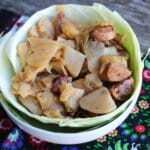 You can alway use sweet onion if you don’t have shallots but I love the unique flavor these shallots add to this Slow Cooker Sausage and Cabbage. Time to peel three medium sized russet potatoes and cut them into chunks. 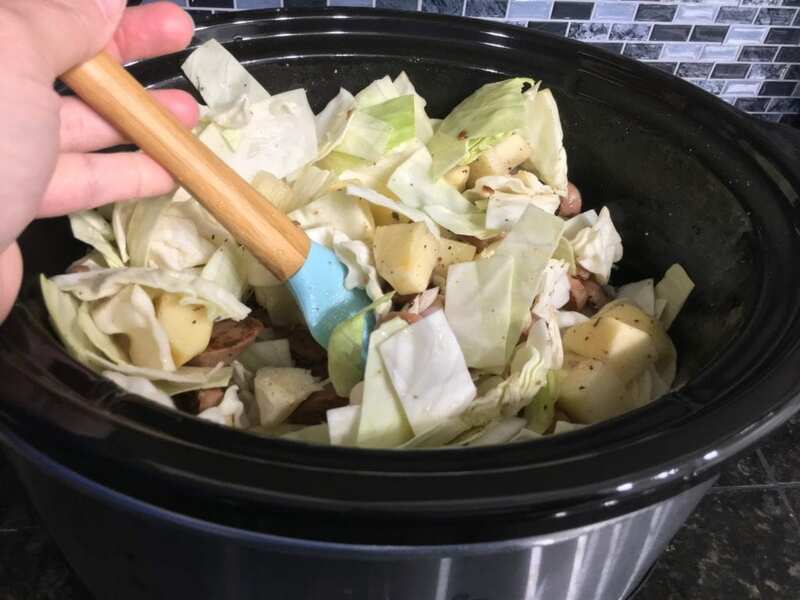 Add the potatoes to the Crockpot slow cooker along with the chopped cabbage and shallots. 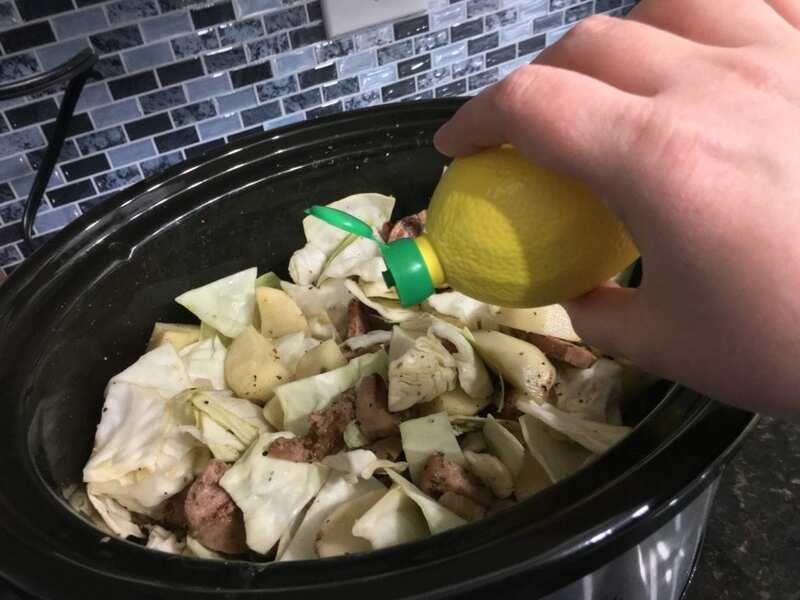 Time to add in that lovely seared Chicken Apple Sausage to the slow cooker with the cabbage, shallots, and potatoes. Peel, core, and slice up one large apple (any kind). 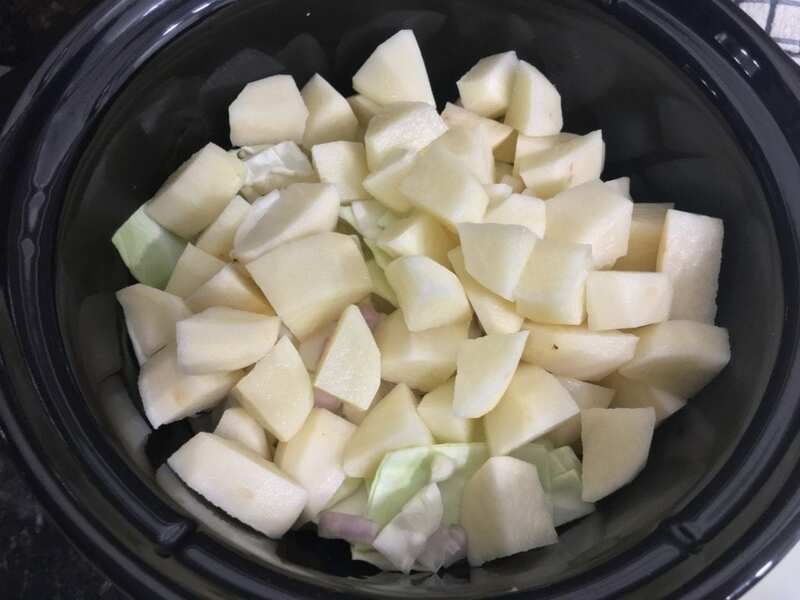 Add the sliced apple into the slow cooker with the other ingredients. Time to add in some seasonings! I used ground black pepper, salt, and Old Bay seasoning. 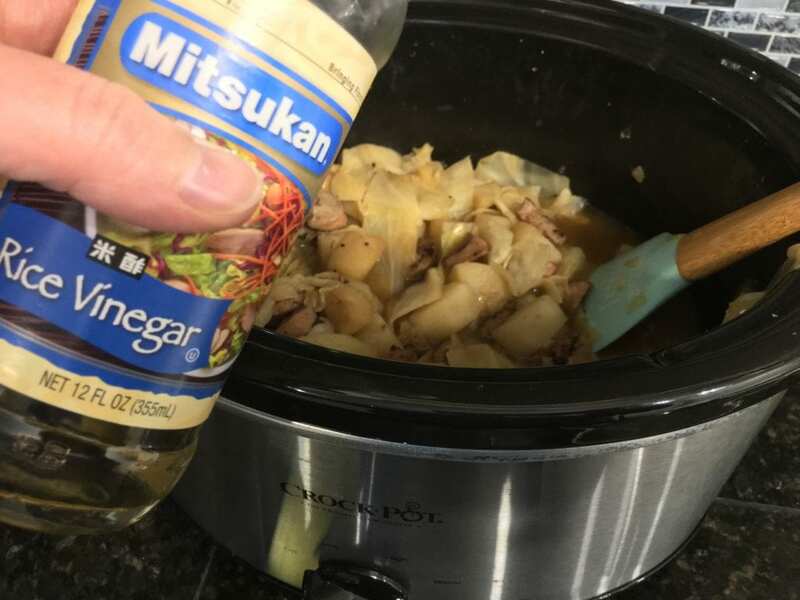 Ya’ll know I like to cook by instinct but if you need a guide for the amount of seasonings used, start by adding 1/2 teaspoon of all three and then once the Slow Cooker Sausage and Cabbage is cooked, taste it and add more if needed. Once the seasonings have been added, pour in sixteen ounces of reduced sodium Chicken Broth. I like to use my own homemade broth when I have some on hand, but I didn’t happen to have any so I had to buy some from the store. After adding in the chicken broth, add two tablespoons of lemon juice. At this point, I decided I needed to add some reduced sodium Lawry’s seasoned salt. I just sprinkled some in but if you prefer a guide for measurement, start with 1/2 of a teaspoon and add more once this dish is cooked if it is needed. Give everything a good stir and get ready to start crocking! 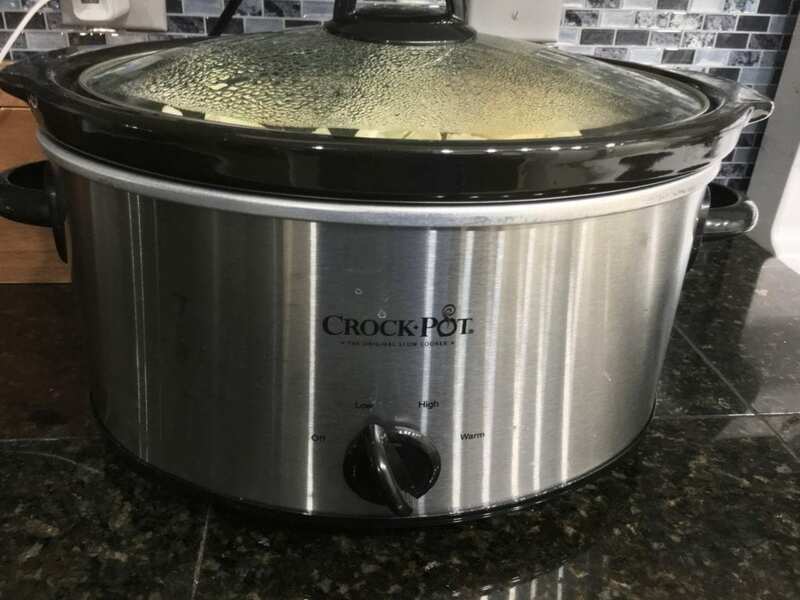 Place the lid on the Crockpot slow cooker and set to cook on high four hours or low six hours. 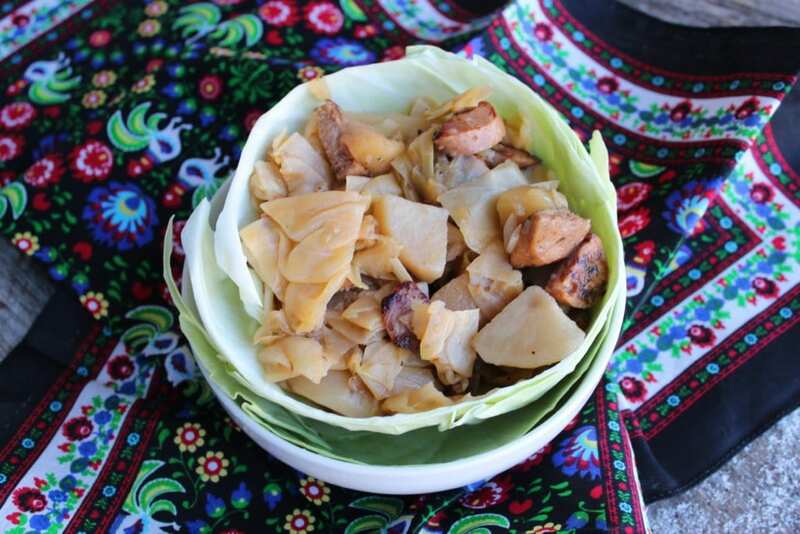 When the Slow Cooker Sausage and Cabbage is cooked, add in 4 tablespoons of white rice vinegar and stir well. This can be found down the Asian food aisle in any major grocery store. 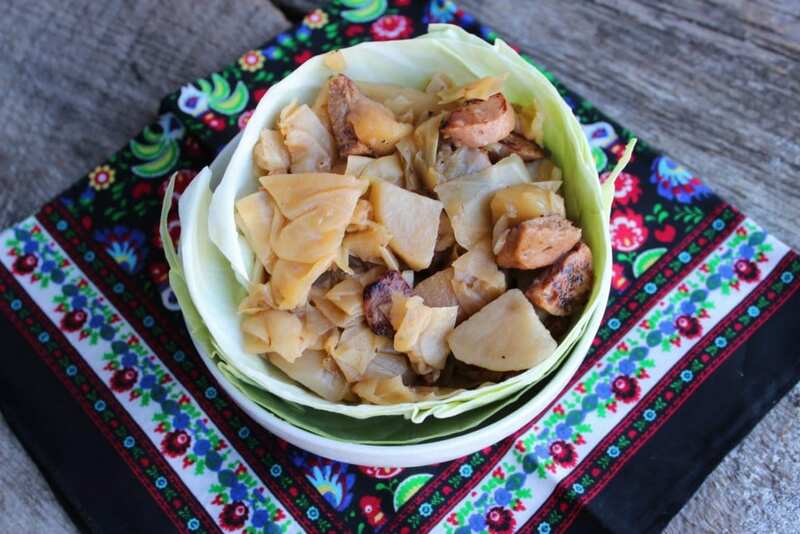 Once you add the White Rice Vinegar to this Slow Cooker Sausage and Cabbage, it is ready to serve! Grab yourself a bowl and enjoy! Yum! 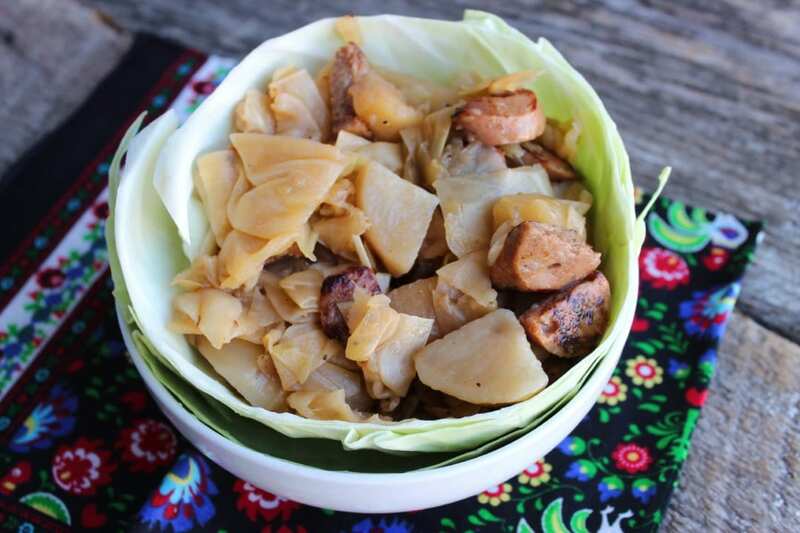 Hot, comforting, bowl of simple Slow Cooker Sausage and Cabbage goodness! 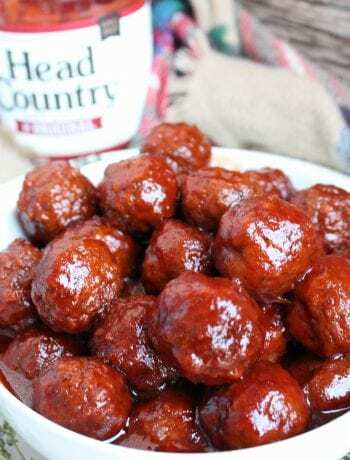 Also a perfect way to celebrate St. Patrick’s Day if you are looking to make a more Irish themed recipe for dinner that night. Happy eating my friends, and Happy St. Patrick’s Day to all who plan to celebrate! 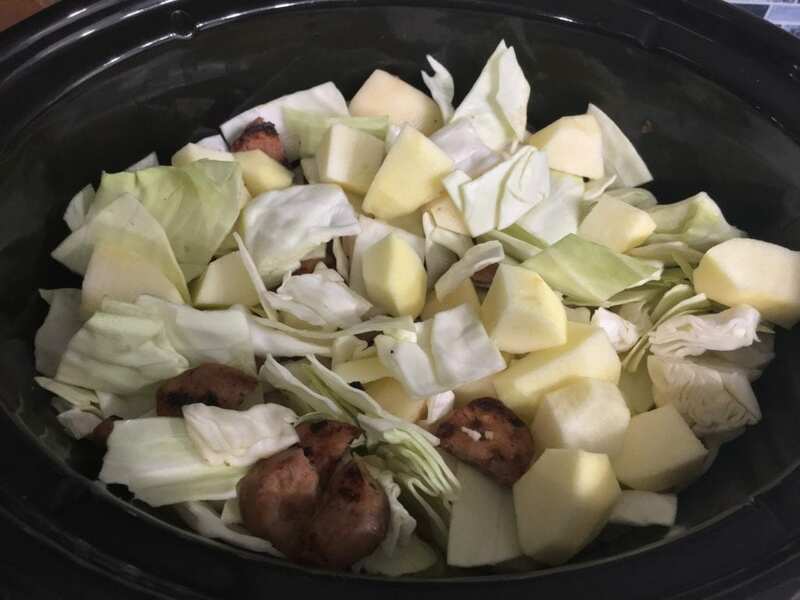 A delicious, hearty sausage and cabbage meal all cooked in the slow cooker! Remove the casing from the chicken sausage and slice the chicken sausage on the diagonal. 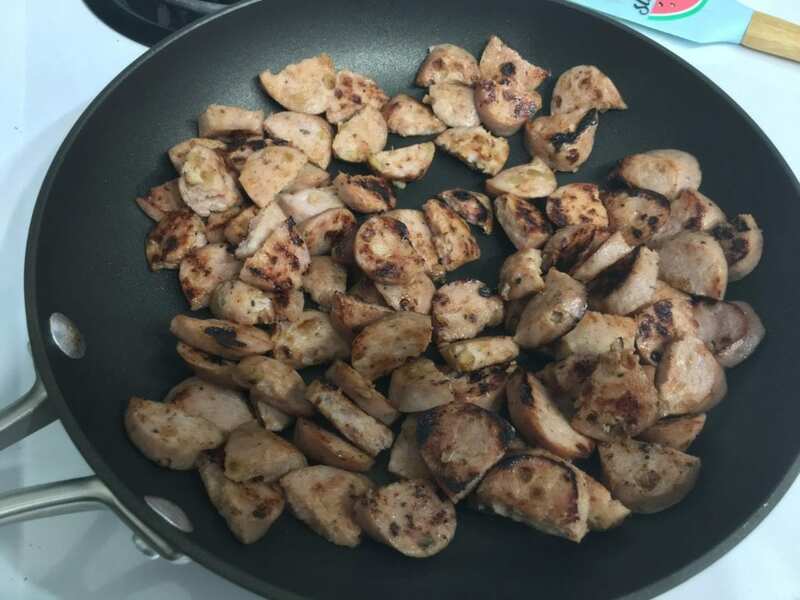 Place the sliced sausage in a hot skillet and sear until blackened. Add the seared chicken sausage to the slow cooker. 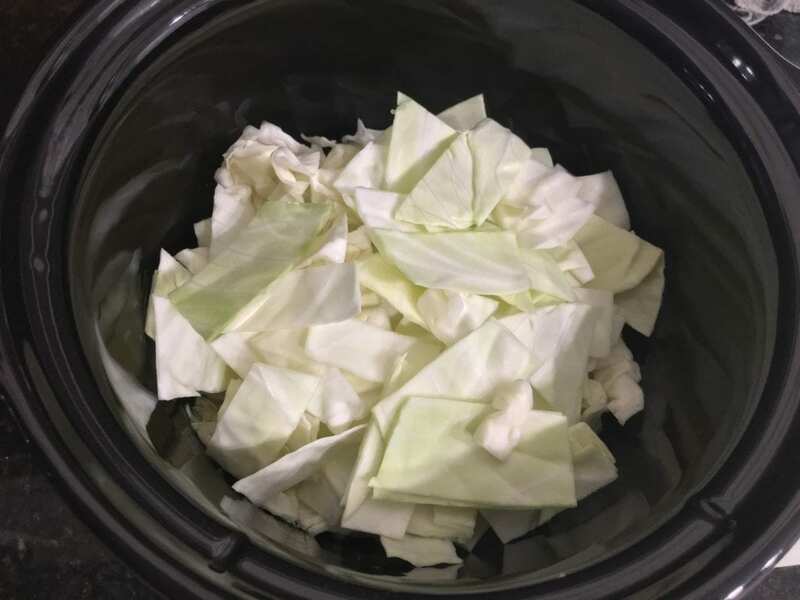 Wash and dice up the cabbage into large chunks and add to the slow cooker. 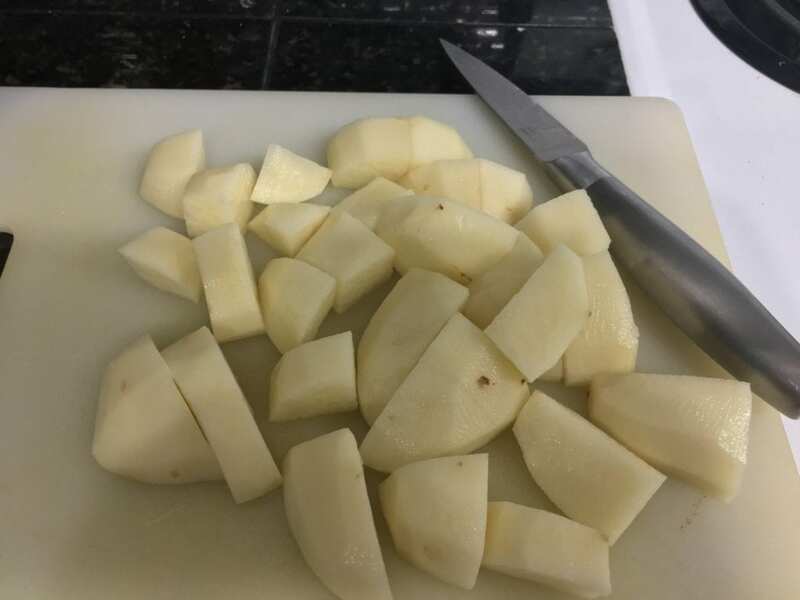 Peel the potatoes using a potato peeler and dice into large chunks. Add to the slow cooker. Peel and dice the shallots and add to the slow cooker. 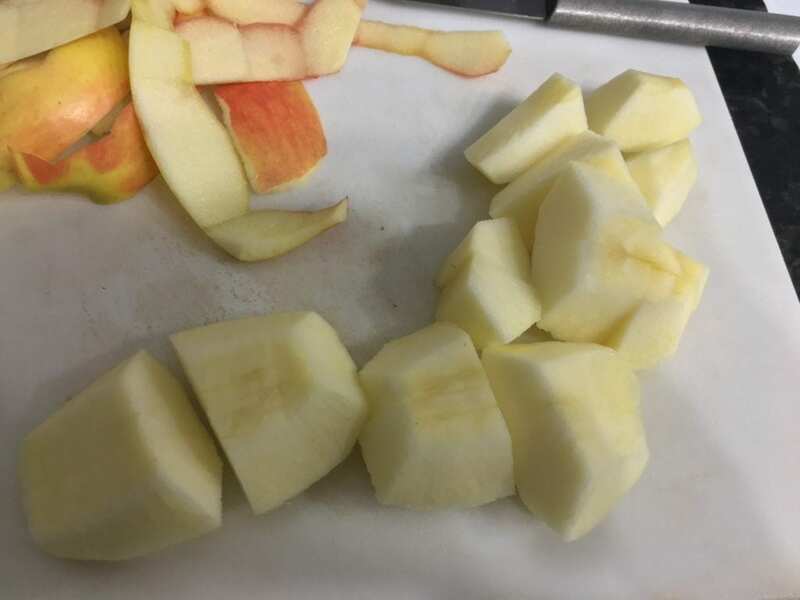 Peel, core, and slice one apple into large chunks and add to the slow cooker. Add in the broth, lemon juice, and all seasonings except the vinegar and stir well. 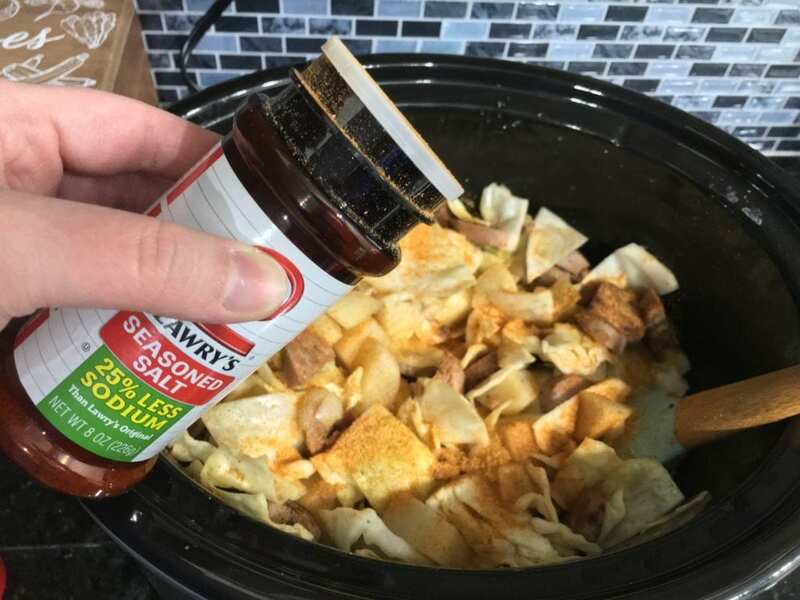 Place the lid on the slow cooker and cook on high for 4 hours or low 6 hours. Once cooked, stir in the vinegar and serve hot. 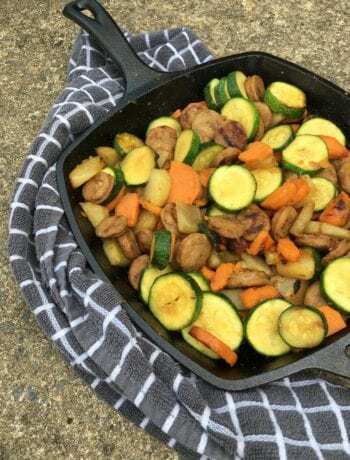 Omit the russet potatoes for a Keto or low carb version of this recipe.